Santuario A, Località Case Bottaro, Tempio di Nettuno. Santuario di Poseidone. Sanctuary A, Località Case Bottaro, Temple of Neptune outside Pompeii. Sanctuary of Poseidon. According to Kockel, in the Località case Bottaro about 750m south-west of the Porta Marina, in late 1975 when removing construction material, approximately 370 fragments of ceramic items were found. Except for an about 100m long wall, no firm fixed structures came to light. See Kockel, V., 1985. Funde und Forschungen in den Vesuvstädten I, Archäologischer Anzeiger, I985, p. 568. Barnabei, L., Contributi di archeologia vesuviana, Volume 3. Rome: L’Erma di Bretschneider, p. 35-6. Bielfeldt R., Der Liber-Tempel in Pompeji in Sant’Abbondio. Oskisches Vorstdtheiligtum und kaiserzeitliches Kultlokal, dans MDAI-Römische Abteilung, 113, 2007, p. 365, Abb. 24. Cooley, A. and M.G.L., 2004. Pompeii: A Sourcebook. London: Routledge, E14, p. 89. De Caro S., in Dobbins, J. J. and Foss, P. W., 2008. The World of Pompeii. Oxford: Routledge, p. 80. Descoeurdes J. P., in Dobbins, J. J. and Foss, P. W., 2008. The World of Pompeii. Oxford: Routledge, p. 11. Dobbins, J. J. and Foss, P. W., 2008. The World of Pompeii. Oxford: Routledge, p. 438. D’Ambrosio, A., 1984. La stipe votiva in località Bottaro, Naples. D’Ambrosio, A and M. R. Borriello, 1990. Le terrecotte figurate di Pompei, Rome. Guzzo P., in Dobbins, J. J. and Foss, P. W., 2008. The World of Pompeii. Oxford: Routledge, p. 3. Kockel, V., 1985. Funde und Forschungen in den Vesuvstädten I, Archäologischer Anzeiger, 1985, p. 568. Peterson R M., 1919. The Cults of Campania, MAAR Vol. 1, p. 237. Small A.M., in Dobbins, J. J. and Foss, P. W., 2008. The World of Pompeii. Oxford: Routledge, p. 185. Località Case Bottaro, Tempio di Nettuno. Map with location of temple = C.
Photo courtesy of Ruth Bielfeldt. See Bielfeldt R., Der Liber-Tempel in Pompeji in Sant’Abbondio. Oskisches Vorstdtheiligtum und kaiserzeitliches Kultlokal, dans MDAI-Römische Abteilung, 113, 2007, p. 365, Abb. 24. According to Small, several extra-mural sanctuaries have been identified, all of which go back to the pre-Roman period. The sanctuary at Bottaro in the so-called Borgo Marinaro, was probably dedicated to Neptune. See Small A.M., in Dobbins, J. J. and Foss, P. W., 2008. The World of Pompeii. Oxford: Routledge, p. 185. 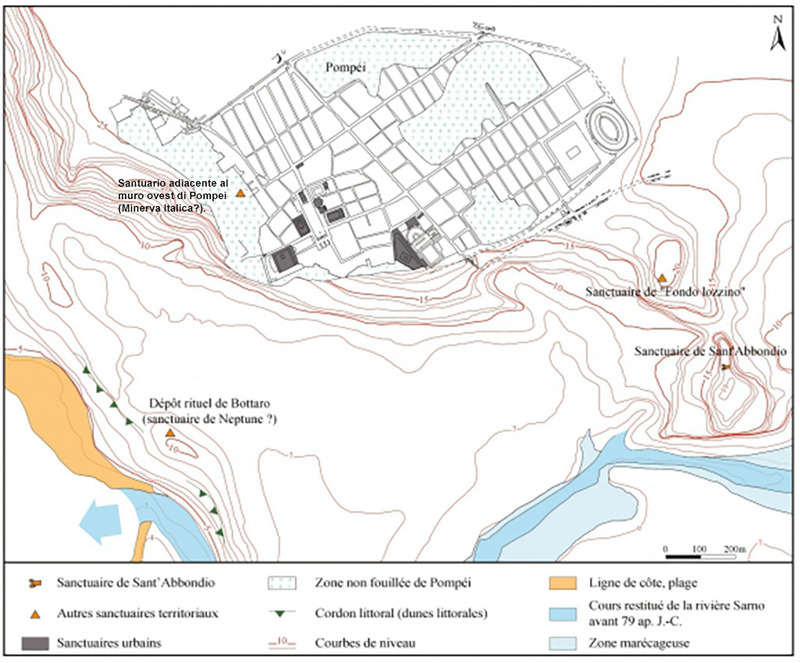 According to De Caro, a Pre-Roman sanctuary was located in contrada Bottaro, in the area between the city and the sea. This sanctuary must have been located, as the sand dunes observed during the excavation indicate, directly on the bank of the lagoon delta where the port of Pompeii was located. The sanctuary was probably dedicated to Poseidon, if an inscription with dedication to Neptune by a freedman of Sextus Pompeius found in the same area can be attributed to its Roman phase. Remains of the archaic and Hellenistic deposits, and fragments of the temple building, already destroyed in antiquity, with part of the Oscan inscription dedicating the pavement, have also been found. See De Caro S., in Dobbins, J. J. and Foss, P. W., 2008. The World of Pompeii. Oxford: Routledge, p. 80. Località Case Bottaro, Tempio di Nettuno. Inscription on a marble plaque found in a wall. Photo courtesy of Carlo Raso. According to Fiorelli it was a small marble tablet, found outside the city. As the inscription hints near here must lie the remains of a Temple of Neptune. See Notizie degli Scavi di Antichità, 1881, p. 121. Now in Naples Archaeological Museum. Inventory number 111992. According to the Naples Museum label it was discovered in 1877. Location is given as Pompei, from Bottaro. Sextus Pompeius Ruma, freedman of Sextus, willingly fulfilled his vow to Neptune. The dedicator was possibly a freedman of Sextus Pompeus, the son of Pompey the Great, both of whose titular deities were Neptune. Alternatively, palaeographic analysis suggests, he may have been a freedman of Sextus Pompeius Proculus, a Pompeian magistrate at the time of Nero. According to Cooley, this inscription was found outside Pompeii, towards the shore, perhaps where there was once a temple to the sea-god. Sextus Pompeius Ruma, freedman of Sextus, to Neptune, willingly fulfilled his vow. See Cooley, A. and M.G.L., 2004. Pompeii: A Sourcebook. London: Routledge, E14, p. 89. According to Descoeurdes, since the marriage between Nero and Sabina Poppaea only lasted from AD 63 to AD 65, their visit to Pompeii and their generous offerings to the Temple of Venus must have occurred sometime soon after the earthquake. It was perhaps on the occasion of Nero’s performance in the theatre of Naples in 64. Among the unofficial inscriptions are also those by which private people publicly announce a dedication to a divinity, or a gift to the community. A famous example of the first category is Sextus Ruma’s votive offering to Neptune. Thanks to this we know of the existence of a sanctuary consecrated to this god, most probably situated in the vicinity of the harbour. See Descoeurdes J. P., in Dobbins, J. J. and Foss, P. W., 2008. The World of Pompeii. Oxford: Routledge, p. 11. 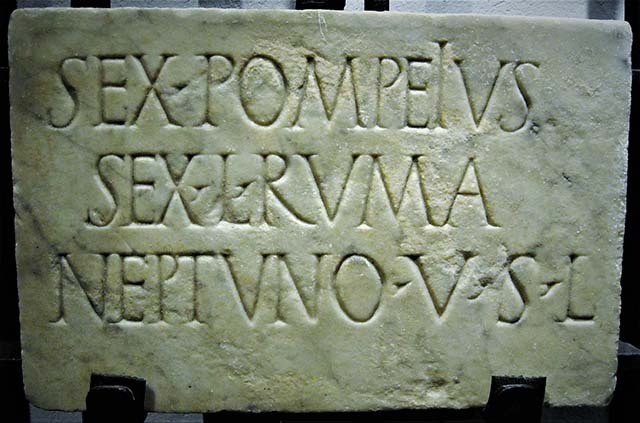 According to Barnabei, the dedicator was evidently a slave of Sextus Pompeus, son of Pompeo Magno (Pompey the Great). The inscription must be interpreted within the ideology of the “novus Neptunus”, epithet of Pompey the Great, propagated by Sextus, who was said to be son of Neptune. At the same wall were found a bearded male bust, with head covered with a pileus (brimless cap), a bronze lamp and other gold items. On this basis it was hypothesized by Fiorelli and others that there was a sanctuary dedicated to the god in the immediate vicinity. This hypothesis, initially judged risky, was brought back into consideration when between 1975 and 1977 large quantities of votive deposits were found in Località Bottaro. In the course of an excavation in April 1981 ancient material was found, with fragments of tiles and amphorae and a fragment of a floor with an Oscan inscription in white tesserae, but too mutilated to be fully interpreted. The structure in Località Bottaro is old enough to be considered a place of worship for Neptune or a substitute sea divinity, in the Republican or Imperial ages. The Oscan inscription is pertinent to the Samnite phase of the temple. See Barnabei, L., Contributi di archeologia vesuviana, Volume 3. Rome: L’Erma di Bretschneider, p. 35-6. Località Case Bottaro, Tempio di Nettuno. Temples Plan after Guzzo 2005, p. 12-13. According to Guzzo, it is possible that Pompeii had gradually downgraded the archaic Stabian settlement’s role as a port. Pompeii’s predominance was facilitated by the control it could exercise on the mouth of the Sarno, located just south of the fortified hill of the city. On the right bank of the mouth of the Sarno is attested, at least from the fifth century BC, the Sanctuary of Poseidon at Bottaro. The approximate chronological coincidence between the end of the Stabian necropolis and the establishment of the cult at Bottaro seems significant. See Guzzo P., in Dobbins, J. J. and Foss, P. W., 2008. The World of Pompeii. Oxford: Routledge, p. 3. Località Case Bottaro, Tempio di Nettuno. Bust of a woman. According to Kockel, approximately 370 fragments of ceramic items were found. The material stretched from the 6th century up to the Augustan period. Bucchero fragments and an antefix come from the 6th century. From the second half of the 4th century italic ceramics are plentifully represented, later also Campana-ware, which seems to have some local special shapes. Female statuettes, which repeat a Hellenistic type predominate. D'Ambrosio interprets the find, because of the fragmentation of the individual pieces, provisionally as a storage space for votive material, possibly of a temple in the city. A sanctuary of Poseidon-Neptune has hypothetically been located somewhere in the vicinity of the site. Perhaps also the plates of the late Hellenistic terracotta frieze, found at the Casa delle Nozze di Alessandro, could belong to this sanctuary. See Kockel, V., 1985. Funde und Forschungen in den Vesuvstädten I, Archäologischer Anzeiger, 1985, p. 568. Località Case Bottaro, Tempio di Nettuno. Fragment of a female figure.